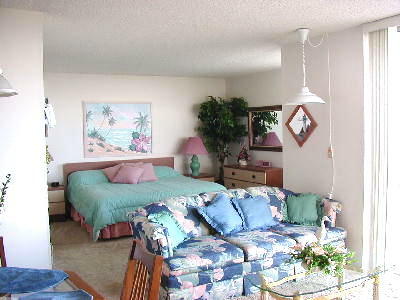 Gertrude's Condo is beautifully located on the south end of the island, in the famous Estero Beach & Tennis Club. If you ever wanted a relaxing yet exciting vacation right on the Gulf, Gertrude's Condo is for You. This Seventh-floor condo offers a cheerful decor. Beautifully decorated to appease any taste. Look out on your private terrace. Beautiful Views from the 7th Floor. 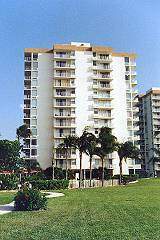 Welcome to Estero Beach & Tennis Condominiums. 7300 Estero Boulevard, Fort Myers Beach, FL 33931. Located on the south end of Ft. Myers Beach on the beach side across the street from Santini Square Plaza Shopping Center. There are three towers on the complex with 296 total units. Each building is 12 stories high, with Gertrudes Condo occupying space on the 7th floor of the first building. 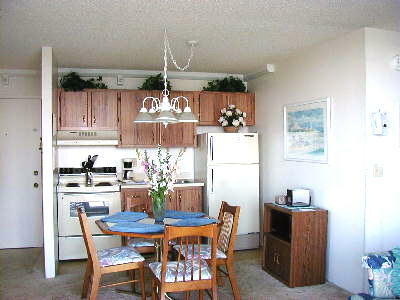 Gertrudes Condo is approximately 600 square feet and is a one bedroom. It has a King size bed and a tub/shower combination in the bathroom. The kitchen comes completely furnished with all the comforts of home. There are linens, cooking utensils, stove, refrigerator, microwave and more. The couch in the sitting area pulls out into a queen size bed. There is also a TV, VCR, stereo, cable, and spectacular views from your balcony. 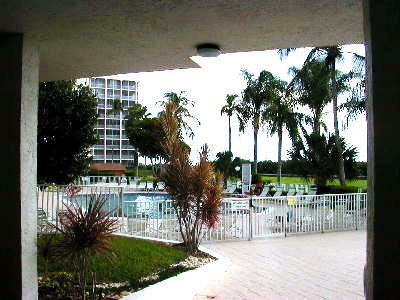 Estero Beach & Tennis has four tennis courts, a large heated swimming pool, washer/dryer units on the main floor of each building, indoor sitting areas with outdoor views, shuffle boards, and a picnic/BBQ grill area. Not to mention a path straight out onto the beach. Santini Square Shopping Center is just across the street. Within the shopping center is a small grocery, hardware, drug store, clothing, restaurants, deli, pizza, ice cream shop, gift and small furniture stores, etc. for your convenience. 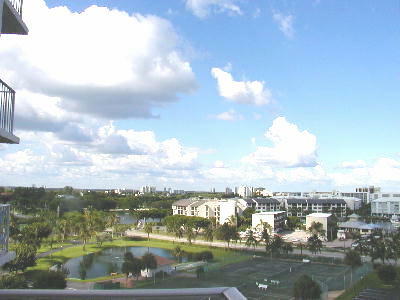 A public golf course and marina are located next to the shopping center. Approximately five miles north is Fort Myers Beach Times Square with restaurants, shopping, the boardwalk, entertainment, and outside cafés. Gertrudes Condo is privately owned and is a non-smoking unit. Sorry no pets allowed. All these things contribute toward it being very clean and comfortable and cozy. Club facilities are continually up-graded. There is a new walkway on the back lawn to the tidal pool (hosting a variety of native birds) -- and to the beach immediately beyond, which has always been free of crowds. Excellent maintenance never fails, as can be observed in the swimming pool, tennis courts, garden areas, and the regularly up-dated building paint and carpeting. Everything you'll need is within walking distance including a food market (or if you prefer, a new large supermarket five minutes by car), restaurants, a hardware store, a gift shop (with a local post office), and a drug store. A few blocks away is a new, not-too-large movie theater with informal tables and seating arrangements for casual dining while watching the film. Ten minutes by car takes you to a library. If you desire to move a little further out from the immediate condo neighborhood, a rich array of activities are possible including art museums, concerts, theater events, bird-watching, nature lectures and tours, canoe trips, boating, fishing, and golf.